Can't get enough of these hand painted floral designs... Love it love it love it! It's a pity my left hand cannot paint flowers. SOB. Nail design from Nail Max! I'm loving the colour combination here. Soft pink shades with pink and purple roses. Awww. 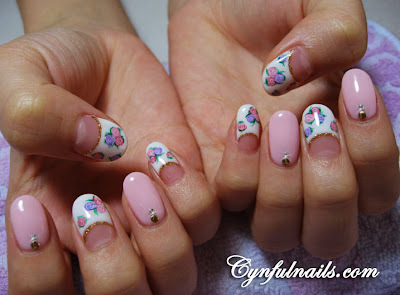 Oh and this is Miyake Wong's nails. And yes her skin is flawless and she is still pretty without makeup. JEALOUS MAX. Painted scallop lace on the french line.